The Crimean port of Sevastopol has been the base of Russia’s Black Sea Fleet since the 18th century. RBTH tells the story of General Eduard Totleben, who organized the defense of the city from the British and French in the Crimean War, buying valuable time for the Russian forces. 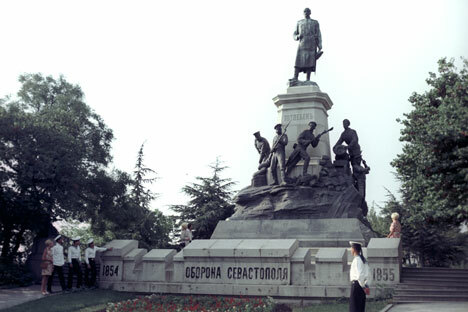 Sevastopol, now part of the Russian Federation, has since its founding in 1783 been primarily associated with the navy. It is often called the “sailors’ city” in Russian, but after losing their fleet during the Crimean War 160 years ago, Sevastopol’s sailors went ashore to engage the enemy in land battles that would reap the city as much glory as any sea victories. These were battles fought from defensive installations that would secure their place in the nation’s history along with the name of their designer, Eduard Totleben, a founding figure of the Russian Imperial Army’s School of Fortification. The great Russian writer Leo Tolstoy lived and fought through most of the siege as an artillerist at the fourth bastion, one of Totleben’s emplacements. He later devoted a series of stories to the defense of Sevastopol. The siege of Sevastopol lasted 11 months. During this time the Allies lost around 70,000 men, not including losses from sickness. Russian losses were approximately 83,500 men. It all began with the gifted engineer’s transfer to Simferopol following his time and experience of assaulting fortified positions in the earlier wars in the Caucasus and with Turkey. Sevastopol was to become the site of the main battles of the conflict that broke out after France and Britain decided to go to war to avert a Russian breakthrough in Turkey via the Bosphorus Strait. When Totleben met the head of the Russian Crimean forces, General Menshikov, the commander declined to assign him to duty. Instead, the engineer began working as a volunteer and soon discovered that the city was prepared for attack only from the direction of the sea and had scant semblances of fortification on its other flanks. Meanwhile, the combined British and French landing force disembarked on the Crimean Peninsula on September 2, 1854 and defeated the Russians at Alma, making a siege of Sevastopol inevitable. The entrance to the Sevastopol Bay estuary had already been blocked with scuttled Russian warships, denying close approach to the Allied vessels. Consequently they were unable to disembark and storm the undefended city in one fell swoop, and after flanking Sevastopol in an arc, the allied French and British forces landed instead to the south. Although some time had been won, Totleben was still faced with the task of transforming the city into a fortress right under the enemy’s nose. Defensive systems were built on the principle of creating bastion concentrations of artillery interlinked by trenches for the placement of small arms, with separate gun batteries dotted between the larger positions. The main defensive stronghold was located on the commanding heights of Malakhov Hill. Work went on around the clock and continued under enemy fire after the start of the siege on September 13. All damage from shelling was repaired the first night and work began on reinforcing the front. Twenty new gun batteries were built and equipped by October 20. The French completed their earthworks at the city walls soon after, and Totleben took this as a sign that the enemy would now switch to mine warfare. He immediately ordered probing shafts to be dug beneath the city’s defensive ditch in order to counter this threat and hastily began to prepare the necessary mine laying equipment. Meanwhile, an all-out assault on Sevastopol could not go ahead without preparatory engineering works, and the placement of mines was an entire science in itself. The sappers started work on several dummy tunnels to distract the Russians and force them to focus efforts on neutralizing one underground excavation at a time. Even before the war, however, Totleben had started using a sounding device consisting of an ordinary naval compass that was lowered into the mining shaft. The magnetic field of the saltpetre contained in gunpowder unfailingly turned the compass needle towards the genuine mine tunnel being built by the enemy. The second assault began on March 28, 1855, during which the Allies took heavy casualties but were able to exert pressure on the Russian positions. A third and fourth assault brought the same results. The emplacements were destroyed but were then rebuilt after the attack. On June 8, Totleben was wounded in the foot while descending from Malakhov Hill and had to leave the city soon after due to the onset of gangrene, returning to Sevastopol only on August 24. Three days later he saw from the windows of the Northern fort barracks that, despite such great efforts to defend it, Malakhov Hill had been taken. This signified the fall of the southern flank and then the entire city. During their retreat the Russians burned down Sevastopol, blew up their powder stores and scuttled the remaining warships in the bay. After the fall of the city, Totleben used his newly acquired experience to prepare the defense of Nikolayev, the seizure of which would open the way for the anti-Russian alliance to forge ahead into the steppe expanses north of the Black Sea. However, the Allies probed the defensive capabilities of the city but did not press home the offensive. Russian ambitions had been thwarted by then and the war had essentially already been won. At peace negotiations in 1856 Russia was forced to cede any Ottoman possessions and forbidden from establishing a naval arsenal on the Black Sea – a ban that was enforced until the 1870s. After the Crimean campaign Totleben devoted himself to the science of fortification. He was appointed director of the army’s engineering department and spent the remainder of his days developing new defensive line systems for use on Russia’s borders. He returned to Sevastopol only after his death and temporary burial in Germany in 1884. His remains were later reinterred in Sevastopol’s Fraternal Cemetery. Alexander Korolkov is an historian and holds a Ph.D. in history.